A Daily Dose of Fit: Do you BOSU? 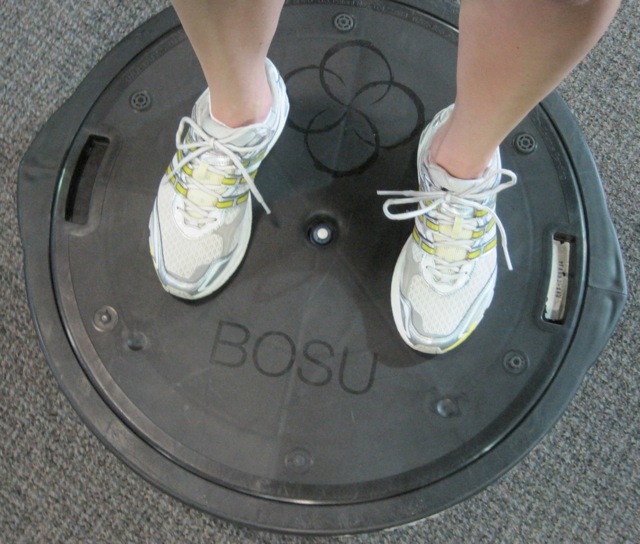 If you've ever been inside a fitness facility, odds are you've come across a BOSU balance trainer. Essentially, a BOSU is one half of an exercise ball mounted on a platform. And in my opinion, this piece of fitness equipment is quite possibly one of the best. According to the manufacturer's website, the BOSU keeps you "present and fully engaged in the training process." And not just because you'll be trying so hard not to fall off it. This little mound of wonder calls upon your core, and as you've probably noticed, your core supports almost every aspect of movement by facilitating balance. And so while you're on the BOSU, you are focusing on that core of yours because it's what will stop you from falling off. 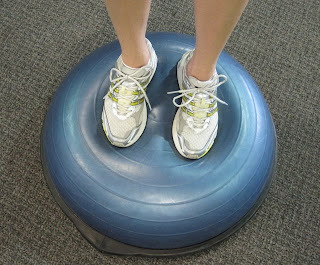 As you get more comfortable standing on the BOSU, you can integrate other aspects of your workout. Think bicep curls, even squats. Maybe shoulder abductions. Any strength training you can do on your feet, you can probably do on a BOSU once your balance is good enough. Once again, balance training is good for all types of movement. So if you incorporate more movement into your time on the BOSU, you'll find yourself "fully engaged" in all that you're doing. And once you get really, super good at standing on the BOSU—flip it over! A BOSU, however, is so much more than a platform on which to stand. Pushups on either side pose a great challenge. Sit on the rounded side and do crunches, or shoulder lifts with your feet a few inches off the ground. Use a BOSU instead of the steps for some aerobic ooomph. Or put your feet on the flat side when you do tricep dips next to a bench. Really, honestly—another case of the "options are endless." So next time you're at the gym, don't be shy. Grab a BOSU and find a little corner by a mirror and give it a go. And if your gym doesn't have BOSU balance trainers, you absolutely must put up a stink about it!